Acquired Taste performs near the bridge crossing. Neil Sturgeon, CEO of Allytics, is on guitar and vocals at right. Greg Sullivan (bass) is at center, Rob Schwend (guitar) at left, and hidden is Roger Dyksterhuis (drums). Well, I couldn’t beat the bridge this year. Not even close. 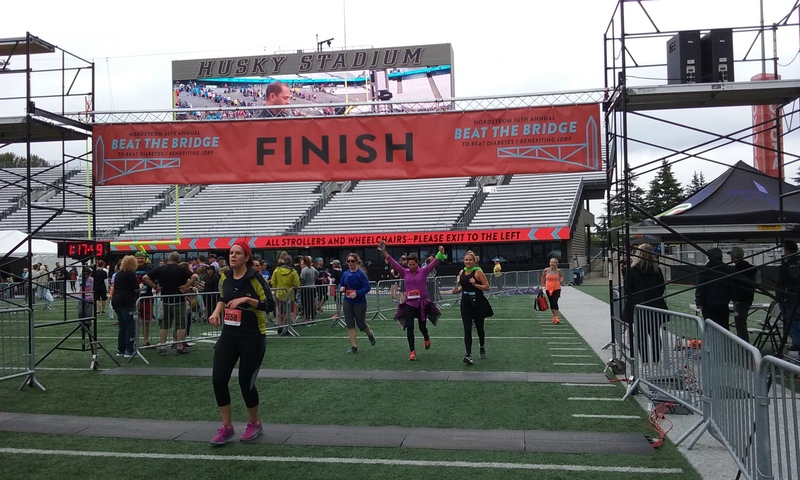 For 36 years, the popular Nordstrom Beat the Bridge 8K Run has required that you run close to a 10-minute mile or better to get to Mile 2 before Seattle’s University Bridge raises to let boats through. If you don’t make it by 8:50 a.m., you must wait five or so minutes for the bridge to come down to resume running — and the waiting time gets added on to your race time. 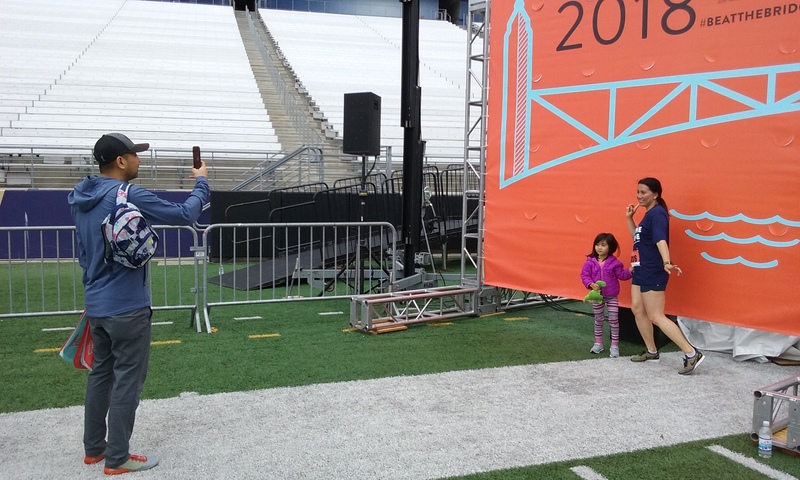 In last Sunday’s 36th annual race that starts and finishes at the University of Washington, I got to the bridge while it was raised and about two or three minutes before it came back down. I was joined by a few hundred others out of 3,650 who did the run. The good news is that it allowed me for the first time to hear my chief executive officer’s band play live and take a few pictures. 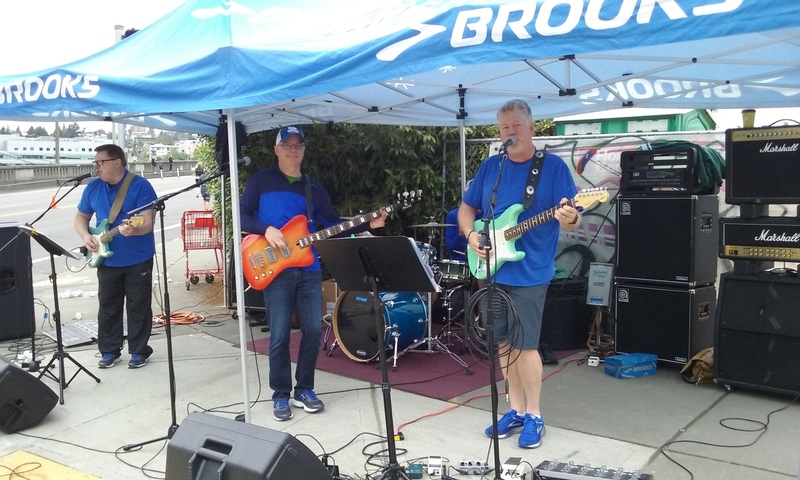 For several years now, the CEO and co-founder of Allytics, Neil Sturgeon, and his rock band Acquired Taste have entertained race participants near the bridge crossing. Set up under a Brooks tent, the band had just ended one song and started “Happy Together,” the classic Turtles tune, when I finally labored my way to the bridge. Neil plays guitar and sings lead vocals for the band. I am familiar with his band’s work, as I have at least two of the CDs they’ve produced, Mother of All Guitars and Monica (the latter of which appears to be mostly Neil’s work). But I’d never heard them live. I can’t say I had much time to listen, but it was great to see them on stage, including Greg Sullivan, the band’s bass player (who is still working at Microsoft, where he worked with Neil). While Neil is a professional musician and keeps a guitar in his office, I believe that his true passion is marketing and pleasing clients. He rolls up his sleeves and coaches and participates in many of our campaigns for customers. I’ve learned a ton from him about delivering good marketing, and I can only hope he feels I’m a better product marketing manager than a runner (and if he ever needs a washed-up drummer, I’m in). That said, there’s no question he’d drop everything to tour with the Foo Fighters, if they asked. About the race: It was awesome to run this event again, as I did for five years from 2003-07. 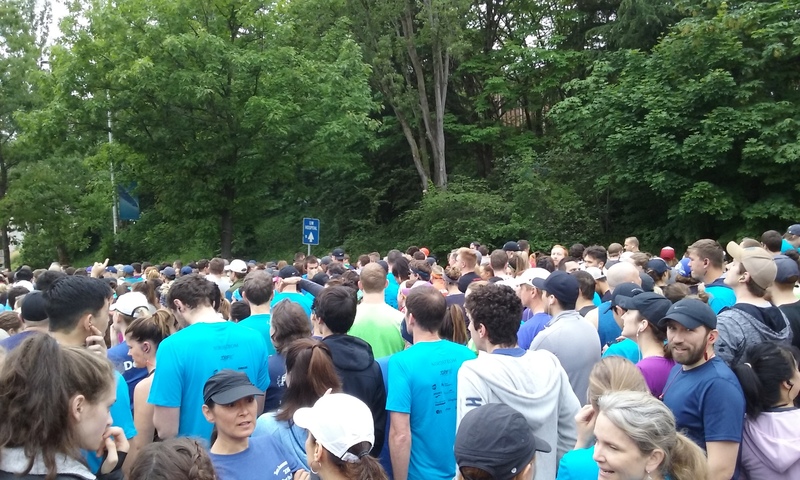 The course is the same flat, five-mile loop through the UW campus and neighborhoods to the south. The only difference is that you don’t run around the track at Husky Stadium to the finish line, because they removed the track in 2011. Now you finish on the football field and it’s even cooler. I never worried about beating the bridge back then. Even in 2004, when I did the race a week after running the Capital City Marathon in Olympia, I beat the bridge easily. In 2005, I got my personal best Beat the Bridge time of 43:30 (8:45 per mile). In 2006, I even forgot about the bridge, as I decided to run in the slowest of three waves — the wave that started last. The bridge began raising as I got there, and I wondered what was going on, and how could something like this happen in the middle of a race! Well, duh! 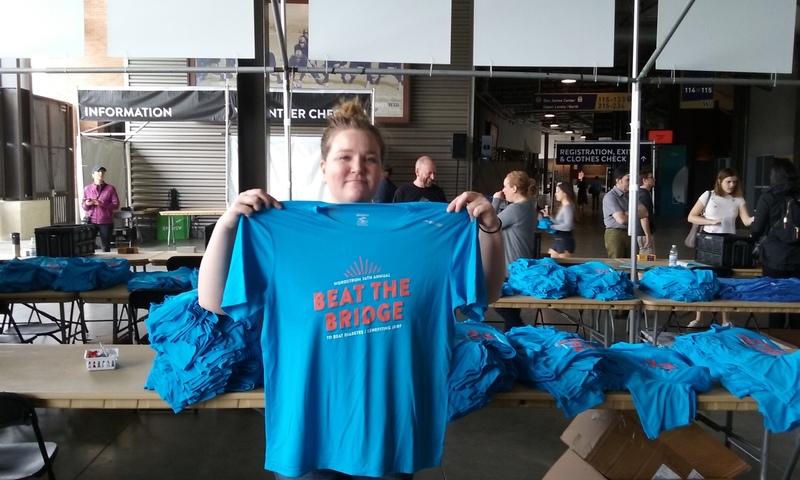 It’s Beat the Bridge Run! I didn’t beat the bridge that year, needless to say. My race time was over 48 minutes because of the waiting time. That was the only year when I didn’t beat the bridge, though, until 2018. Knowing my chances this year were slim, my strategy was to start the race (no longer are there waves) as close to the front as possible. That was foiled by the sheer amount of people queued up at the starting line. There were just too many runners in my way to get any closer than being sandwiched somewhere in the middle. When the race finally started, there was limited running room until about a half-mile, when things opened up. Suddenly, however, I felt every runner on the planet passing me. At the same time, I started to feel winded. Those first two miles, trying to beat the bridge, were the toughest. The short rest at the bridge crossing, when I got to hear Neil’s band, was much needed. When the bridge came back down and I resumed running, I was much more relaxed. I passed numerous people in the last three miles; too bad they were all walking. 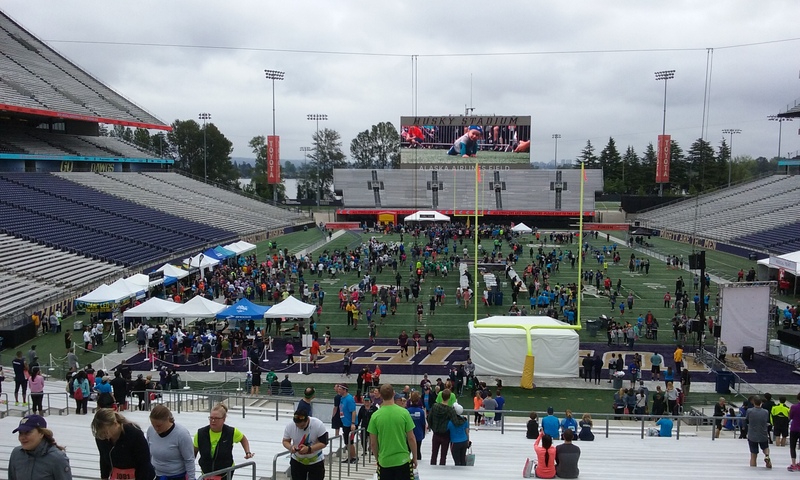 Finishing inside Husky Stadium was great fun. My time was 1:09:32 (14:00 per mile), counting the waiting time at the bridge. I ended up 3,455th out of 3,646 runners, which will have to do for my second race after major ankle surgery (and 215th race overall). Full results are here. Many runners were already back to their cars by then, but a few thousand stayed, mingled and took selfies. 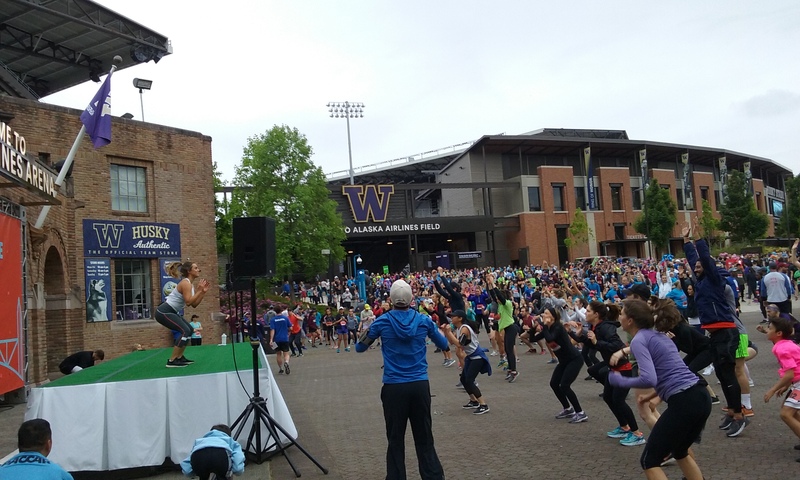 There was even a last “crawl” race for kids in diapers; this was truly a family event. 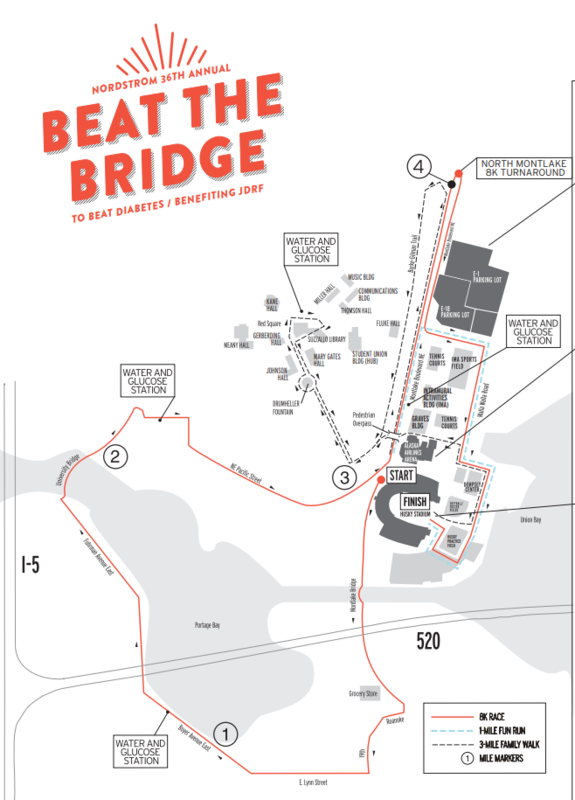 I will run this race again, but probably won’t even try to beat the bridge. It’ll be a chance to hear more from Acquired Taste. Equally challenging as beating the bridge raising near the UW is climbing some of east King County’s steepest hills on a bicycle. That’s what I will be doing on Memorial Day, riding in the 7 Hills of Kirkland 40-mile event. I’ve done this ride — either the 40-mile course or the Metric Century (60 miles) — every year since 2012. It benefits Attain Housing, a Kirkland-based nonprofit to help shelter homeless families. My first post about this ride is still featured at the bottom of the 7 Hills website. The Flying Wheels Summer Century (I will probably do the 67-mile course) follows on June 2, less than a week later, as bicycling season moves into high gear. Just had some work done on my Trek bicycle, so I’m eager to see how it performs. Back to running races later in June. Thanks for reading, and enjoy the Memorial Day weekend! This entry was posted in 7 Hills of Kirkland, 8K, ankle surgery, Bicycling, Century, Flying Wheels, Marathons, Running and tagged 7 Hills of Kirkland, Acquired Taste, Allytics, ankle surgery, Beat the Bridge Run, Bicycling, Flying Wheels, Marathons, Neil Sturgeon, Running. Bookmark the permalink.